Does your pumpkin need a facelift? Let’s face it, once you’re done removing the orange goo and the ritual of carving the family pumpkin is over, old Jack can start to look a little tired within a few days, especially in the South. 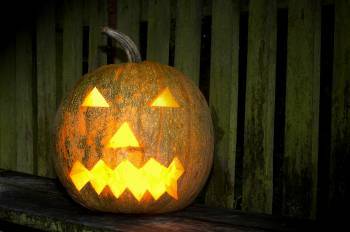 * Put your pumpkin in cold water after it’s carved; it will soak up the water and get firm. * If your pumpkin starts to shrivel, put it back in cold water for one to eight hours. * Add a very small amount of unscented bleach to the water to stop premature molding. * Put a thin coating of petroleum jelly on exposed, cut edges to keep the water from evaporating and to preserve the cuts, as well as the pumpkin. * Spray your pumpkin with a plant mister to keep it from shriveling. This entry was posted on Friday, October 29th, 2010 at 1:02 pm and is filed under The Hestia Report. You can follow any responses to this entry through the RSS 2.0 feed. You can leave a response, or trackback from your own site.